Interested in property and the market that surrounds in York? 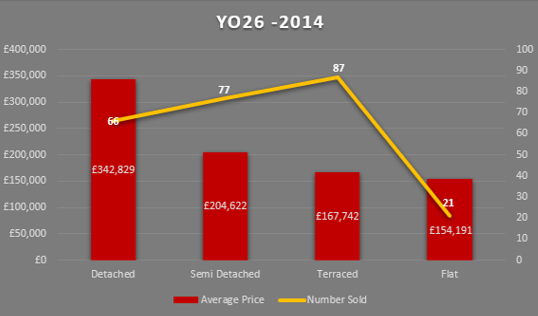 We've prepared a document which compares YO26 to YO31 in regards to both the average price that different types of properties sold for, as well as the number of each type of property that was sold per month, comparing the 2014 market to the 2018 market. This data was then used to give an example of the type of rental yield that can be achieved via different types of properties in the two areas in 2018, as well as an insight into the capital growth accrued over the last 4 years. According to the Office for National Statistics composite price index, prices in 2018 are 8.74% higher than prices in 2014. The pound experienced an average inflation rate of 2.12% per year during this period. Please feel free to call Elliot on 01904 231022 or via email at elliot.bortman@belvoir.co.uk if you'd like to receive the full document. Alternatively, I'd be happy to prepare a similar document for any other post codes in the York area, free of charge.